The sheet music for He's A Pirate (from Pirates Of The Caribbean: The Curse Of The Black Pearl) written by Klaus Badelt, is available below. He's A Pirate (from Pirates Of The Caribbean: The Curse Of The Black Pearl). 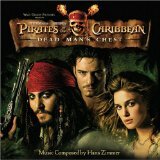 He's A Pirate is part of the Original Motion Picture Score from Pirates Of The Carribean: The Curse Of The Black Pearl, which was composed by Klaus Badelt and Hans Zimmer. The track was first released in 2003, together with the rest of the soundtrack. It is what you could call the main theme of the movie, and featured in all of the other sequels of the movie (Dead Man's Chest, At World's End, On Strange Tides). The piece was often used for remixing by many popular DJs, such as DJ TiÃ«sto. In order to see the sheet music for He's A Pirate (from Pirates Of The Caribbean: The Curse Of The Black Pearl) please click on the preview button next to the score you are interested in. We have 5 arrangements of this song available for 4 instruments.